parts of India to reconstruct the history of this period. They include the stone tools, pottery, artifacts and metal implements used by pre-historic people. The development of archaeology helps much to understand the life and culture of the people who lived in this period. In India, the prehistoric period is divided into the Paleolithic (Old Stone Age), Mesolithic (Middle Stone Age), Neolithic (New Stone Age) and the Metal Age. However, these periods were not uniform throughout the Indian subcontinent. The dating of the prehistoric India is done scientifically. The technique of radio-carbon dating is commonly used for this purpose. It is based on measuring the loss of carbon in organic materials over a period of time. Another dating method is known as dendro-chronology. It refers to the number of tree rings in wood. By counting the number of tree rings in the wood, the date of the wood is arrived at. The next stage of human life is called Mesolithic or Middle Stone Age which falls roughly from 10000 B.C. to 6000 B.C. It was the transitional phase between the Paleolithic Age and Neolithic Age. Mesolithic remains are found in Langhanj in Gujarat, Adamgarh in Madhya Pradesh and also in some places of Rajasthan, Utter Pradesh and Bihar. The paintings and engravings found at the rock shelters give an idea about the social life and economic activities of Mesolithic people. In the sites of Mesolithic Age, a different type of stone tools is found. These are tiny stone artifacts, often not more than five centimetres in size, and therefore called microliths. The hunting-gathering pattern of life continued during this period. However, there seems to have been a shift from big animal hunting to small animal hunting and fishing. The use of bow and arrow also began during this period. Also, there began a tendency to settle for longer periods in an area. Therefore, domestication of animals, horticulture and primitive cultivation started. Animal bones are found in these sites and these include dog, deer, boar and ostrich. Occasionally, burials of the dead along with some microliths and shells seem to have been practiced. A remarkable progress in the prehistoric India is noticed in the Neolithic Age. 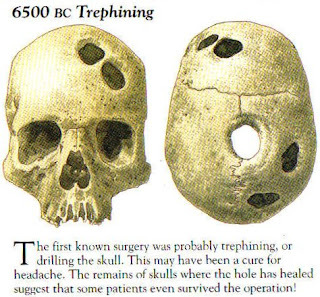 It is approximately dated from 6000 B.C to 4000 B.C. Neolithic remains are found in various parts of India. These include the Kashmir valley, Chirand in Bihar, Belan valley in Uttar Pradesh and in several places of the Deccan. The important Neolithic sites excavated in south India are Maski, Brahmagiri, Hallur and Kodekal in Karnataka, Paiyampalli in Tamil Nadu and Utnur in Andhra Pradesh. The chief characteristic features of the Neolithic culture are the practice of agriculture, domestication of animals, polishing of stone tools and the manufacture of pottery. In fact, the cultivation of plants and domestication of animals led to the emergence of village communities based on sedentary life. There was a great improvement in technology of making tools and other equipment used by man. Stone tools were now polished. The polished axes were found to be more effective tools for hunting and cutting trees. Mud brick houses were built instead of grass huts. Wheels were used to make pottery. Pottery was used for cooking as well as storage of food grains. Large urns were used as coffins for the burial of the dead. There was also improvement in agriculture. Wheat, barely, rice, millet were cultivated in different areas at different points of time. Rice cultivation was extensive in eastern India. Domestication of sheep, goats and cattle was widely prevalent. Cattle were used for cultivation and for transport. The people of Neolithic Age used clothes made of cotton and wool. Generally, Chalcolithic cultures had grown in river valleys. Most importantly, the Harappan culture is considered as a part of Chalcolithic culture. 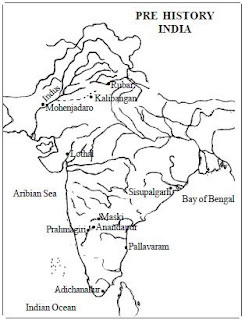 In South India the river valleys of the Godavari, Krishna, Tungabhadra, Pennar and Kaveri were settled by farming communities during this period. Although they were not using metals in the beginning of the Metal Age, there is evidence of copper and bronze artifacts by the end of second millennium B.C. Several bronze and copper objects, beads, terracotta figurines and pottery were found at Paiyampalli in Tamil Nadu. The Chalcolithic age is followed by Iron Age. Iron is frequently referred to in the Vedas. The Iron Age of the southern peninsula is often related to Megalithic Burials. Megalith means Large Stone. The burial pits were covered with these stones. Such graves are extensively found in South India. Some of the important megalithic sites are Hallur and Maski in Karnataka, Nagarjunakonda in Andhra Pradesh and Adichchanallur in Tamil Nadu. Black and red pottery, iron artifacts such as hoes and sickles and small weapons were found in the burial pits. The Harappan Civilization succeeded the Prehistoric India.